use the Manual Annotation Editor. Most of these actions are demonstrated in the step-by-step instructions below; however, you are encouraged to visit the tutorials page before continuing. 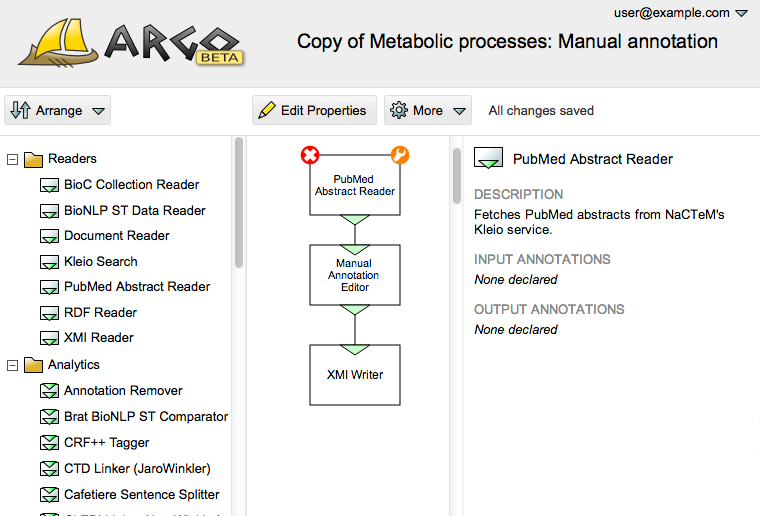 Manual annotation: This workflow reads PubMed abstracts and opens a Manual Annotation Editor for a curator to tag the entities of interest without any support from automatic processing available in Argo. Output: Annotation files in XMI (interchangeable) format. 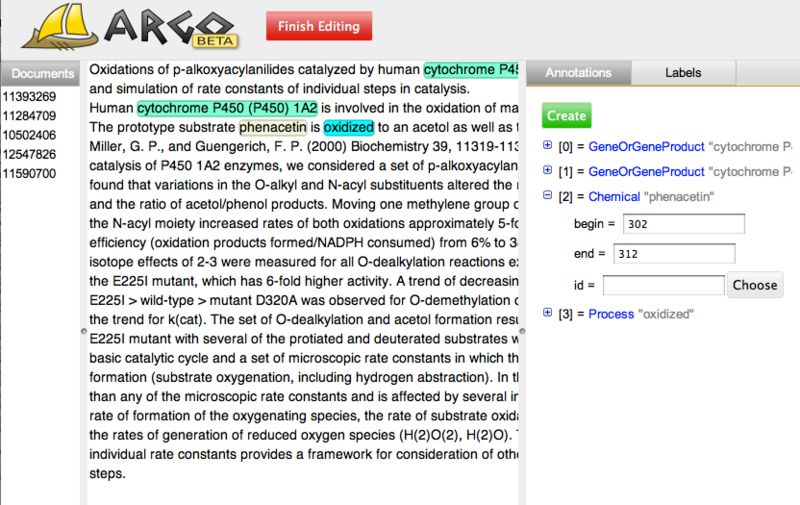 Automatic annotation: This workflow reads PubMed abstracts and performs automatic recognition of the entities of interest. This workflow is purely automatic and does not involve any manual intervention from the curators. 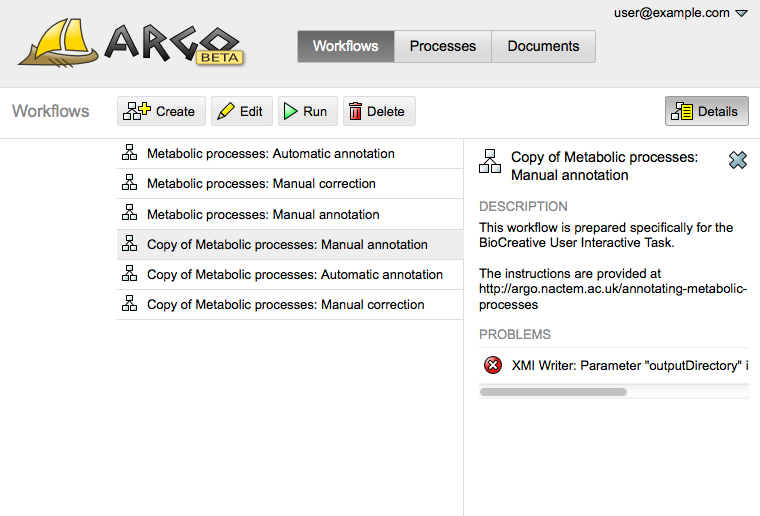 The objective of this workflow is to automatically “pre-annotate” the input abstracts for later manual inspection. Output: Annotation files in XMI format. Manual correction: This workflow reads files that already contain annotations (coming from the second, automatic workflow) and opens a Manual Annotation Editor for a curator to correct (remove, add, modify) the automatically recognised annotations. Input: Annotation files in XMI format. Although the second and third workflow could be combined into a single workflow, for the purpose of evaluation they are defined separately. 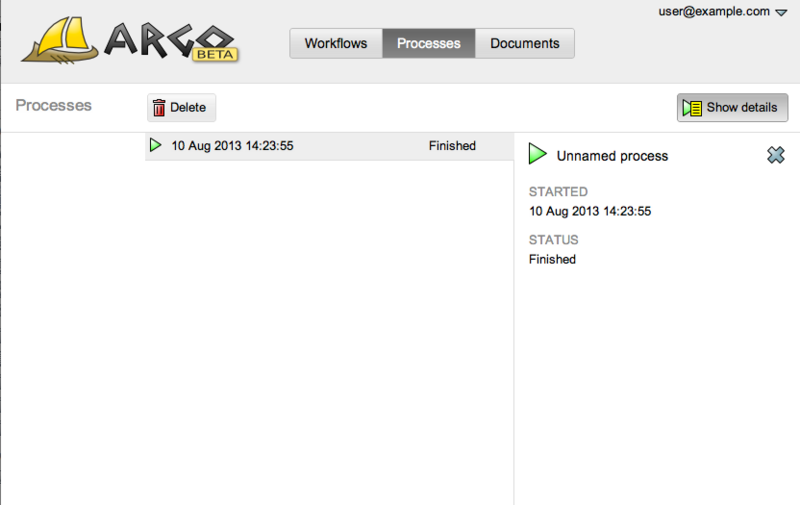 The three workflows are publicly available in Argo. For convenience, you are advised to open Argo’s main application in a separate window and keep these instructions and the annotation guidelines handy. Launch the Argo application in a separate window now! The initial setup involves signing in to or registering an account with Argo, as well as creating folders that will be used to output annotations to. You will also make copies of publicly available, read-only workflows so that you can make some adjustments on them. If you have not done so yet, create an account in Argo and sign in to it. Although it is possible to use Argo without registering, any user-created data (workflows and documents) will be automatically deleted at the end of a visit. Tip: Registering an account in Argo requires a valid email address for verification that is sent immediately after creating an account. Please check your email spam/junk folders if you do not receive the verification email within minutes. Switch to Documents view and make sure the "My Documents" folder is selected in the left-hand-side panel. To create a new folder click the "Create" button. Create the three folders one by one. The three workflows are publicly available for reading only. In order to be able to change their settings (for example, selecting an output folder for generated files) you have to make copies of these workflows. Edit each of the workflows and save its copy. Although it is possible to have multiple workflows with the same name in Argo, we advise you to change the names of copies by, for example, preceding each of them with the “Copy of” prefix. Switch to the Workflows view and select one of the workflows. Click the Edit button to open a new window with the diagram of the selected workflow. In the diagramming window, click on the More button and then select "Save as copy". You will be prompted to change the properties of the workflow. Once the Workflow Details panel has opened, change the name of the workflow. You are free to choose any name that will help you identify it later. We recommend preceding the current name with the "Copy of" prefix. 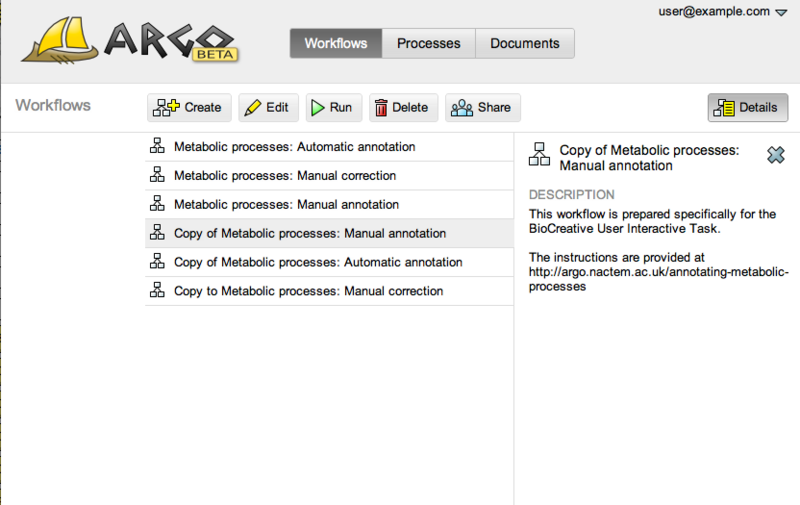 If you go back to the Workflows view, you'll notice that a new workflow has been created. Repeat these steps for the remaining workflows. This phase involves configuring the manual annotation workflow by setting up input PubMed IDs and folders for output annotations as well as running the workflows and performing the manual annotation. The first workflow that you will work with is the manual annotation workflow. 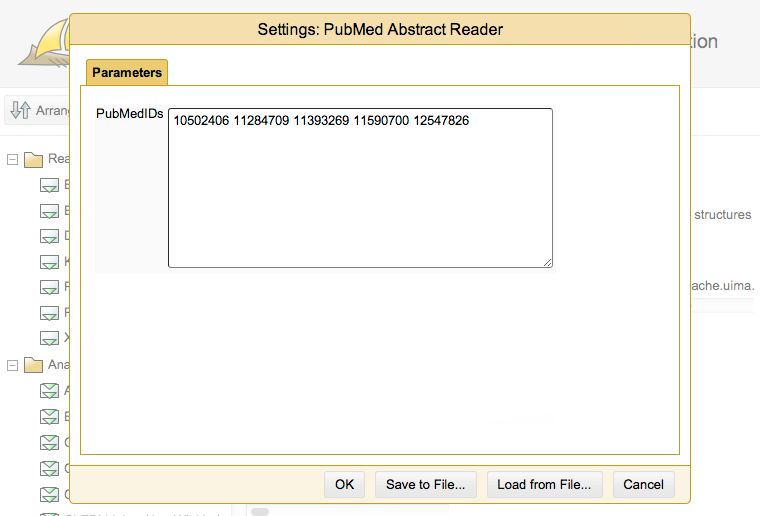 This workflow takes a number of PubMed abstract identifiers as input and generates annotation XMI files on its output. Set up the list of PubMed IDs of the PubMed Abstract Reader component (the first one in this workflow) to the first 5 IDs shown below. Set up the output folder of the XMI Writer component (the last one in this workflow) to the “Manual annotation” folder you created in Step 2. Selet the manual annotation workflow and edit it by clicking on the Edit button. When you mouse-hover over the PubMed Abstract Reader component (the first one in the workflow), you will notice two buttons. Click on the spanner button to open a settings panel for this component. In the settings panel for the PubMed Abstract Reader component, type in or copy-paste the first 5 PubMed IDs from the list in the description below. Mouse-hover over the XMI Writer component (the last one in the workflow) and click on the spanner button that will open a settings panel for this component. 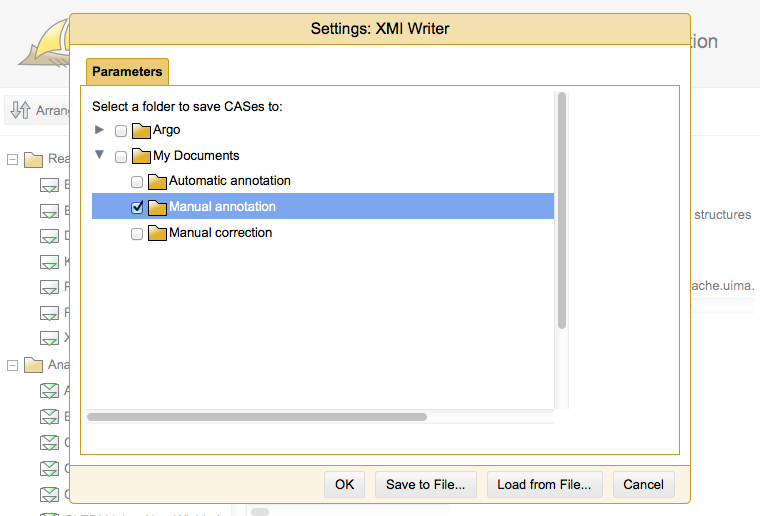 In the settings panel for XMI Writer select the previously created folder for storing manual annotations. Note: Although it is possible to supply the entire PubMed ID list into the PubMed Abstract Reader component, it is not advisable. Argo will not save any of the annotated documents to the output folder before they are all complete. This comes from the fact that Argo allows you to revisit annotated documents and keeps the changes in an internal temporary location until you decide that all documents are complete (that is, there is no more changes to be done). Since the document set if fairly large, it may take days to annotate all of them which carries the risk of losing your work if Argo encounters technical problems. It is therefore advisable to annotate this set in smaller chunks. 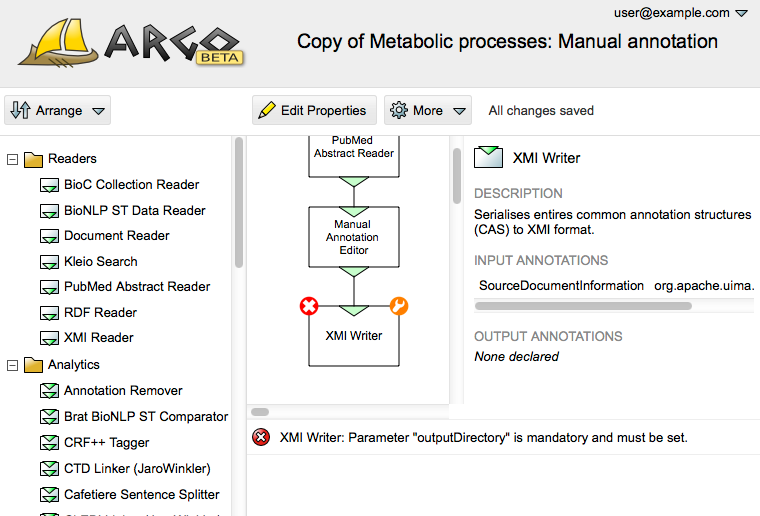 Run the manual annotation workflow and launch the Manual Annotation Editor. The editor will allow you to mark mentions of the entities of interest. 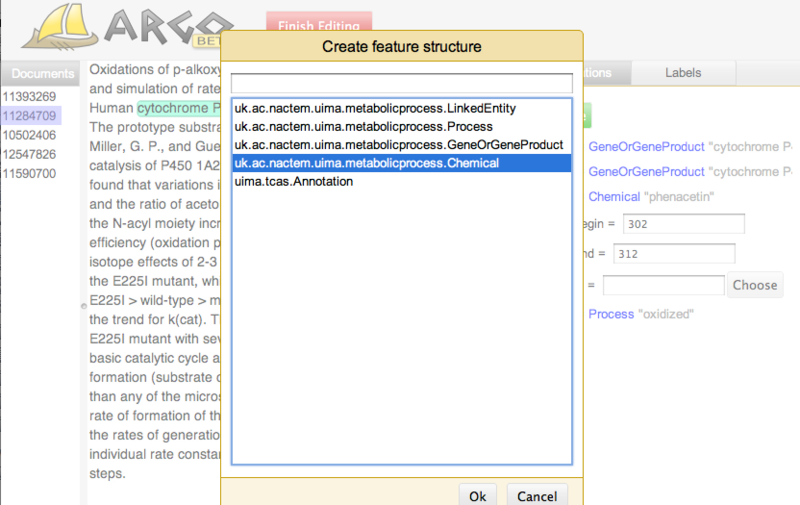 The entity types present in the editor to choose from are Chemical, GeneOrGeneProduct, and Process. All of them have exactly the same features (or attributes). The begin and end features will be set automatically once you have marked a span of text. The id feature, however, has to be set manually. This feature is an external resource identifier of the marked span of text as defined in the guidelines. Once the manual annotation is done, all output XMI files should be visible in the “Manual annotation” folder. Run the selected workflow by clicking on the Run button. Argo will switch automatically to the Processes view. 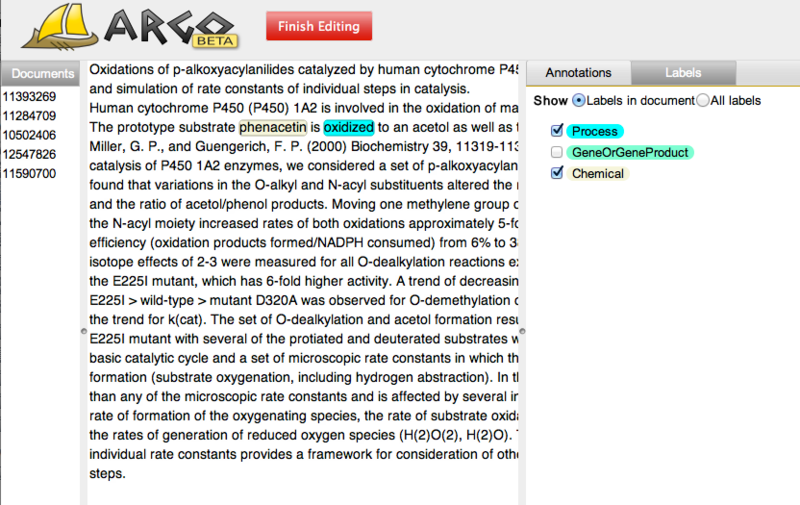 In the Processes view, click on the Launch Manual Annotation Editor from the right-hand-side panel to open the editor. The editor's window is split into three panels. The left-hand-side panel shows a list of documents to annotate. The central panel shows the contents of a selected document and allows you to mark spans of text. The right-hand-side panel shows the annotations in detail. The Labels tab in the right-hand-side panel allows you to switch on and off label markings in the central panel. You can create an annotation by selecting a span of text, which will pop up a window with labels to choose from. In the pop-up window, choose a label that describes the selected span of text. From the list of options, choose only one of Process, Chemical, or GeneOrGeneProduct. The newly created annotation is highlighted in the text. More details about this annotation are in the right-hand-side panel. You may type in an ID of an external resource for this annotation (in the id feature field) or click on the Choose button. The pop-up window will let you choose an ID from a list. The list is sorted by the string similarity of the marked text and the entry from the external resource. You may filter the list to narrow down the options as well as browse details. After all annotations are made in all of the documents, click the Finish Editing button, which will close the editor and signal to Argo that the manual annotation is complete. Back in the Processes view, you'll notice that your workflow has finished. That means that your annotations are now in the output folder. Tip: The Manual Annotation Editor window can be closed and reopened multiple times without losing any previous annotations. This is useful if you decide to take a longer break and close your browser. Next time, simply go back to the running workflow (in the Processes view) and click on the Launch Manual Annotation Editor button (as shown in the slides above). This phase involves configuring the input and output annotation folders of the automatic annotation workflow and running it. 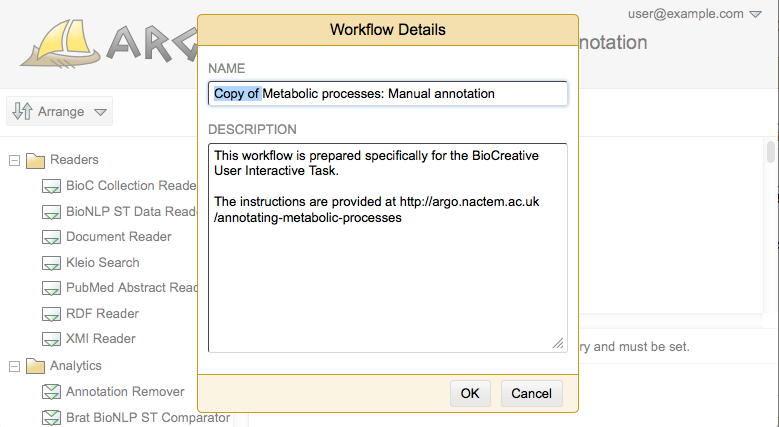 The second workflow you will run is the automatic annotation workflow. Similarly to the previous workflow, this workflow takes a number of PubMed abstract identifiers as input and generates annotation XMI files on its output. Set up the list of PubMed IDs of the PubMed Abstract Reader component (the first one in this workflow) to the first 5 IDs shown below (note that they are different from those in Step 4). Set up the output folder of the XMI Writer component (the last one in this workflow) to the “Automatic annotation” folder you created in Step 2. Run the automatic annotation workflow. 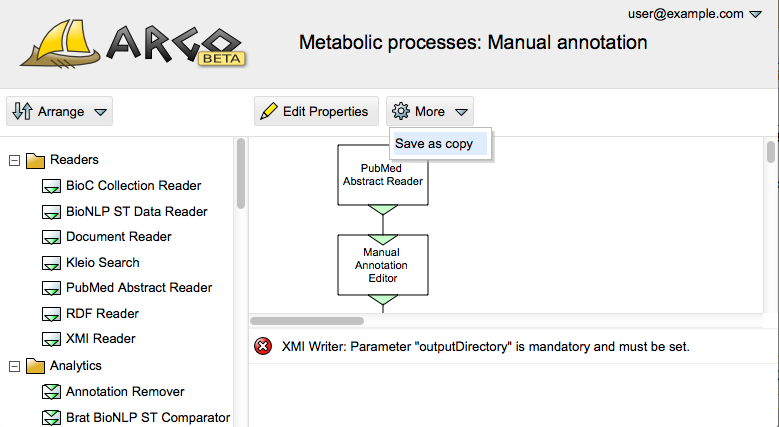 The XMI files containing the automatically generated annotations will be placed in the “Automatic annotation” folder. This phase is similar to the manual annotation phase. The difference lies in the source of input annotations which comes from the output of the previous, automatic annotation workflow. The third workflow you will work with is the manual correction workflow. This workflow takes a number of annotation files in XMI format as input (in this case those produced by automatic annotation in Step 7) and generates annotation XMI files on its output. Set up the input folder of the XMI Reader component (the first one in this workflow) to the “Automatic annotation” folder. Set up the output folder of the XMI Writer component (the last one in this workflow) to the “Manual correction” folder you created in Step 2. Run the manual correction workflow and launch the Manual Annotation Editor. 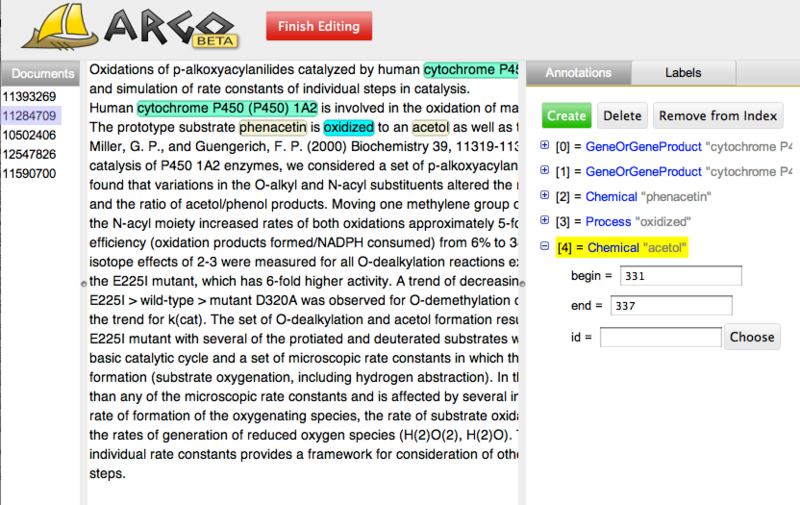 The editor will allow you to correct the annotations generated by the automatic annotation workflow. 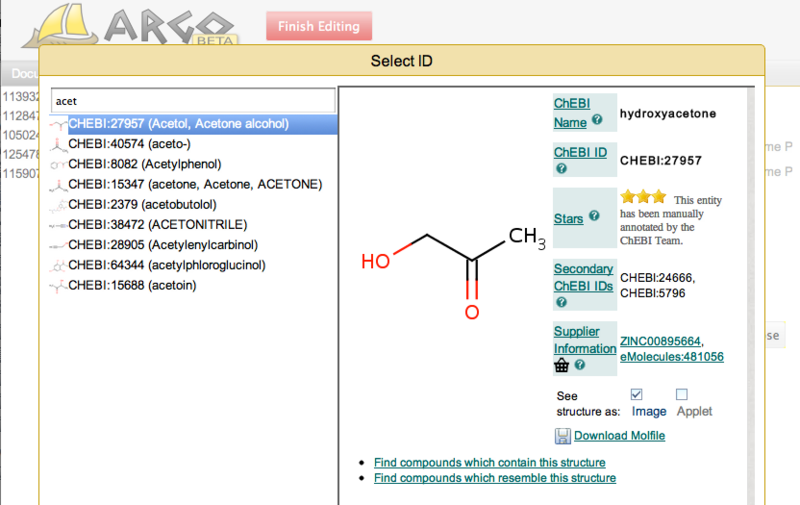 Following the annotation guidelines, you can add missed annotations, remove spuriously recognised ones, change labels (e.g., from Chemical to GeneOrGeneProduct), change spans and change values of the id feature as necessary. Once the manual correction is done, all output XMI files should be visible in the “Manual correction” folder. Can I try the workflows with other PubMed IDs for practice? What should I do if a recognised entity cannot be identified in ChEBI/UniProt/CTD? Nothing. It is expected that some entities will be new to the external dictionaries. They will be automatically pulled from the annotations in post-processing (not part of this curation task) and will constitute a set of new entries for the external dictionaries. How can I view or change annotations at a later visit? As long as the workflow with a Manual Annotation Editor is running, you can view or make changes to any of the documents that are part of this workflow by switching to the Processes view, identifying the right process, and clicking on the Launch Manual Annotation Editor button. If the process has finished, you can still view or change annotations; however, you have to create or edit another workflow. 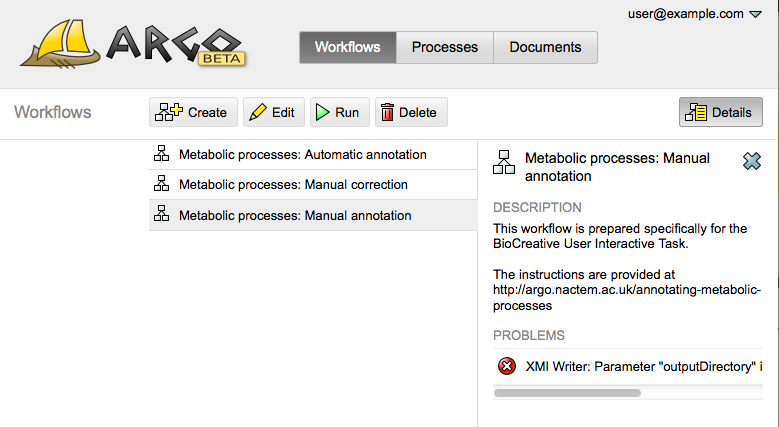 Notice that the “Metabolic processes: Manual correction” workflow is exactly what is needed to accomplish it. Simply edit this workflow, create a copy, rename it to something memorable, and change the input of the XMI Reader to the files/documents you want to view/edit. For the XMI Writer, if you wish to overwrite the input files, select the same folder and tick the “overwrite” checkbox. If you only want to view the files, remove the XMI Writer component from the workflow altogether. Can I see if XMI files contain annotations in the Documents view? XMI files contain annotations even if you have not created any explicitly; they include document metadata. Currently, the Documents view does not visually differentiate between XMI files with “default” annotations and those with added annotations. Can I download the annotations? Yes. Each of the workflows includes the XMI Writer component that writes the original text and annotations to your document space. Simply switch to the Documents view, locate and select the documents you wish to download and click on the Download button in the toolbar. Note: Currently you may download only one document at a time.